Office Ninja: Office Ninja is Officially on iTunes! 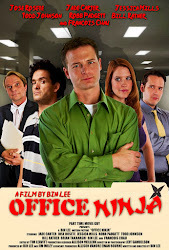 The award-winning comedy OFFICE NINJA starring Jade Carter, Jose Rosete, Francois Chau, Jessica Mills, Robb Padgett and Todd Johnson releases on iTunes today, April 22, 2014. PRLog (Press Release) - Apr. 21, 2014 - LOS ANGELES, Calif. -- ‘Office Ninja’ begins with Tomas (CARTER), a disenchanted office worker on the verge of a dream promotion. For Tomas and his coworkers-- goofball Raheem (ROSETE), newbie Jessica (MILLS), king of douchebags Jett (PADGETT), and their incompetent boss Daryl (JOHNSON) -- each day seems to blend into the next. But a dark change is coming. After finding out that the office jerk Jett has stolen his work as well as his coveted promotion, Tomas swears vengeance and follows the ways of the ninja in his quest to regain his honor and find the evidence that will end Jett's reign of office tyranny. But of course, since he's not an "actual" ninja, his plans for swift justice may not go quite as smoothly as he planned.